When working to obtain a degree in education, one of the requirements is that you do classroom observations of certified teachers at local public schools. These observations give you a chance to see what it’s like to manage classroom behavior and successfully teach a lesson plan outside of the controlled environment of a college education class. 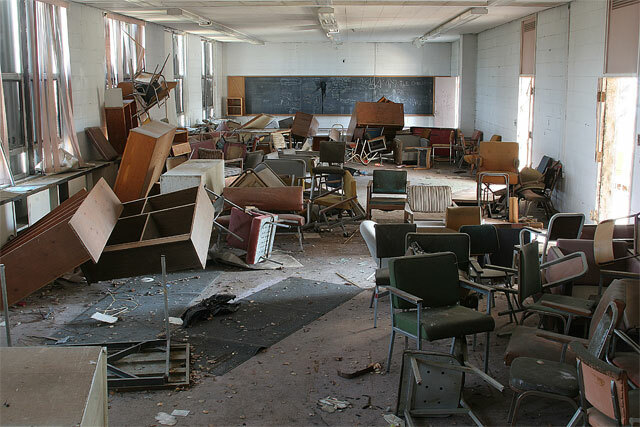 It also gives you a chance to see the spectacular catastrophes that occur when a room full of children loses control. When I was in college, I did many of my observations with the same group of people. One person I always went with was my good friend Brad, who like myself was a music education major and a trombone player. Brad was the type of guy that was very low key, had a subtle yet hilarious sense of humor, and was smarter and more dependable than 99% of the people around him (myself included). In other words, he was one of the few people whose company you could actually tolerate and even enjoy while driving to a school before the sun had come up. One semester, Brad and I were observing an elementary school music class during the mornings before our college classes began for the day. 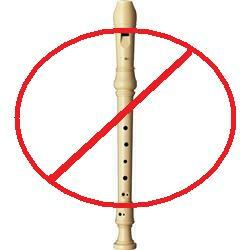 Hearing students attempt to sing ‘My Country, 'Tis of Thee’ or playing the recorder (aka the devil’s instrument) at 7:00 AM is not the best way to start your day. I am often amazed by the fact that kids at that age can be so utterly cheerful and energetic in the morning while I wished for nothing more than complete silence and a place to put my head down. so we can get back to Sociology class and sleep. One day, the teacher asked Brad and I if we could bring in our instruments and play for the class. We both agreed and were actually looking forward to performing for the class. It would be nice to get to do something other than sit in one place and listen to kids sing along with overly cheerful recordings of various patriotic songs. When we arrived at the school that morning, however, Brad and I were greeted with a much larger audience than we were expecting. …until Brad said one of the most ill advised thing that you could ever say to a room full of children. 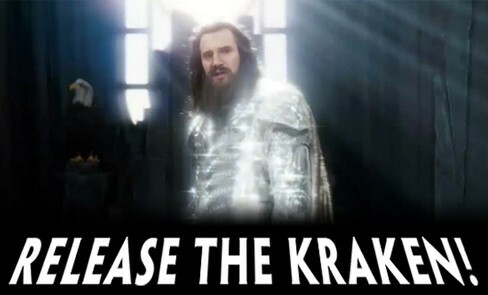 Brad's words being translated by the gods of chaos and destruction. Before I could warn Brad of the absolute ragnarok that he had just commanded, he was already counting off for us to begin playing. My musician's instincts took over and we began our duet. No one, however, was able to tell that we had started because in front of us was the most incredible display of kinetic chaos that I have ever seen in my entire life. This includes multiple rock concerts and college/pro sporting events. A tornado would have been preferable to the absolute terror and destruction that Brad’s call for spontaneous dancing by the students had wrought. 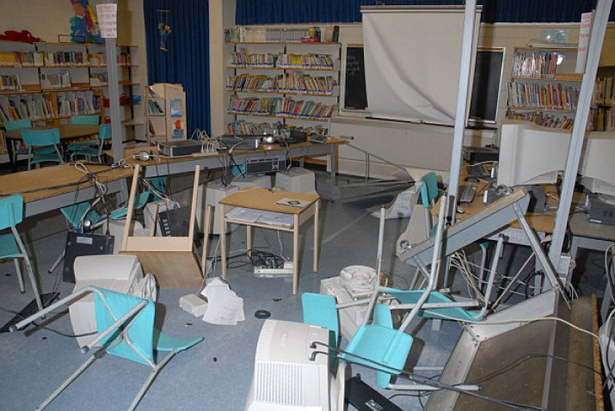 For example: When someone says that kids in a classroom are “bouncing off the walls,” they most likely mean that the students were very hyperactive or at worst, running/jumping within the confines of the floor. What Brad and I observed (as we stoically continued to perform our Baroque duet) were students that were LITERALLY bouncing off the walls. Some jumped towards the wall and kicked off of it with their feet, which sent them hurtling backwards into clusters of their unsuspecting classmates. Others simply flung their entire bodies into the wall and collapsed back onto the floor, only to get back up and repeat the process. Some students went with the more mundane option of simply flailing their arms about while running back and forth across the room. Others dropped to the floor and convulsed as if a demon were being exorcised from their bodies. If a student had experienced a seizure, no one would have known. Why are everyone's pupils dilated? The teacher whose classroom we were in kept a giant beach ball near the back of the room. The ball lasted all of about 15 seconds into the fray until we heard a very loud "Pop!" This of course did not deter any of the mass chaos that was happening around us. I also distinctly remember one of the youngest students that was standing near us. He was attempting to do an actual Irish Jig while complete anarchy raged around him. I appreciated the effort. The noise in the room had also grown to a phenomenally insane level. Shrill screams and maniacal laughter created a wall of sound that completely drowned out our playing and every attempt at a coherent thought. The students were screaming so loudly that by the time we finished the piece, no one was aware that our performance had concluded. Brad and I put down our horns and watched as the teachers desperately tried to regain control of the classroom. It would take them almost 10 minutes to get the class to settle back down and stop losing its collective mind. A few chairs and desks may have needed to be moved back into place, as well. “I guess I shouldn’t have said that,” Brad said sheepishly as a lunch box flew by his head. "Yeah, probably not," I replied as another student crashed into my music stand, knocking it to the floor. It was in that moment that I decided teaching elementary school was not really for me. Of course, if it was the only job available, I'd be willing to take it. But I would need to make sure that there were clear guidelines prohibiting 140 kids from spontaneously dancing in a confined space.